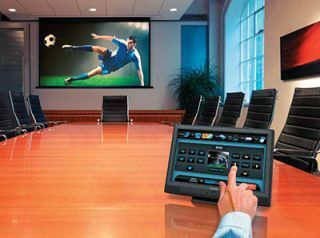 HD video, audio, and collaboration in this conference room are driven by Extron control.The best projectors, displays, and audio systems aren’t worth a dime if employees can’t use them. That reality highlights the business case for treating AV control systems as the equivalent of a keyboard. In fact, when a control system doesn’t get the attention it deserves, it can quickly become a cost center instead of a tool for maximizing productivity. For example, if the user interface (UI) isn’t user friendly, then employees will waste time—and thus money—muddling through or, worse, they’ll require hand-holding by IT staff at every meeting. So what makes a user-friendly UI? For starters, consistency. Ideally a company should have the same basic UI on every touchpanel so employees don’t have to learn a new when they give a presentation in another part of the building or in a branch office across the country. Few enterprise control systems live up to that ideal. For example, as companies grow, they often wind up with a hodge-podge of AV systems. That could be different generations of one vendor’s touchpanels, each with a different UI, or a mix of vendors. If your company already has a mix of different vendors’ touchpanels, it’s possible to reprogram them to get a consistent UI. If you’re working with AV integrator or programmer, you’ll probably have to ask for that kind of service rather than having it offered. Some vendors say their use of standards makes it easier for enterprise technology managers or their integrators to configure and reconfigure their control system to meet their needs. As control systems migrate to IP, one challenge is keeping them from becoming security risks, such as back doors for hackers. In the past, control processors were relatively secure because they weren’t on an IP network and thus were difficult to reach. Many of the best practices and technologies for securing IP control systems are familiar ones for enterprise technology managers. “It should be up to date with the latest security standards such as 802.1x, SSL and Active Directory authentication,” said Nicolas Scott, Crestron solutions marketing manager for UIs, control systems and software. When comparing control solutions, ask the vendor or integrator about each one’s tools for managing not only security, but other aspects. “Our controllers are all password protected with multi-user password levels controlling what each user has access to,” Seegull said. “There are also IP access tables limiting from which computers users can access the control system. That’s a lot to consider, which highlights two things: Today’s IP control systems can do a lot, but making the most of that investment means identifying all of the ways it can fit into your organization, including using IT resources such as Exchange servers. That process takes time. “Any time we start working with a new client, it takes from six months to 12 months in discussion with the IT department to get them to fully understand what we’re trying to present: why it needs to be on the network, what it needs to touch, so it gets fully integrated and accepted by IT,” Lerette said. IP helps make it easier for enterprises to use control systems to meet energy-efficiency goals, including achieving LEED certification. For example, by extending the control system to both HVAC and Outlook/ Exchange, conference rooms now can be automatically changed to less comfortable settings when they’re not booked. Temperature and blower settings also can be automatically set based on how many people RSVP. So far, though, enterprises typically limit their non-AV control integration to lighting and shades. Sometimes the reason is that the company leases rather than owns its offices. Other vendors agree that clients are increasingly considering the possibility. Sometimes the motivation is the opportunity to use a control system to minimize or eliminate tasks that currently require staff to trek out to each room or multiple buildings. Remote access to projectors, lighting and other systems enables IT and facilities staff to work more efficiently. “Companies want to do more than control AV in one room or even several rooms,” Scott said. “They want to monitor and manage hundreds of rooms and all the technology in them, not just AV. They want to manage entire buildings and campuses. The Crestron 3-Series is one example of a control platform with that kind of multi-system flexibility and remote-management capabilities. When comparing solutions, one feature to look for is built-in support for BACnet, a set of protocols that enables communications with HVAC, lighting, and access-control systems, among others. A sleek meeting room powered by a Crestron control system.It’s also possible to have AV control systems hook into Exchange/Outlook, such as to automatically configure a conference room’s AV systems based on the organizer’s requirements. Macros can trigger actions such as lowering the shades, throttling back the HVAC blower to reduce noise and, if there’s digital signage outside, adding a notice that a presentation is in progress. “We implemented this in a recent hotel project where the administrator was able to do just that direct from Outlook,” Seegull said. “Creating the appointment would not only place a message outside the room; it would create and execute the macro within our touch panel to automate the process. That kind of automation can help the bottom line because technology staff won’t have to go out and set up the rooms. In fact, thanks to smartphones and tablets, today’s employees may not want a technician in the room anyway. “Smartphone adoption is helping people use technology and not be afraid of touch-sensitive monitors,” Lerette said. “Most corporate users want to be able to make their own presentations. They don’t need hand-holding to get the system on.” Problems might still occur, but end user confidence is growing.